The EAA Chapter 582 Learning to Fly Blog will feature stories and reviews on the education and learning side of our Chapter. 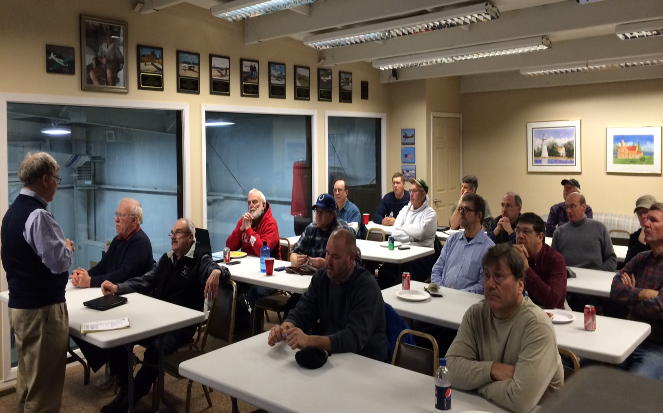 The first meeting of the Toledo Chapter of IMC Clubs was held on Monday January 27, 2014 at our EAA 582 hanger in the Tom Walsh library. Our Chapter hanger proved to be warm and cozy with great technology including surround sound and multi-media projection which worked perfectly for our lively presentations. Much gratitude to the boys at Crow Executive Air for plowing us out last night they did a nice job. We had 20 in attendance which was a good turnout for our first meeting and considering the recent weather. This email will recap all the resources and provide contact information for what we discussed last night. First, this was an FAA Wings Sanctioned Training Event. Bill will be making sure you receive credit for attending but you have to make sure you are signed up for the Wings Program if you haven’t already. Second, we are operating as the Toledo Chapter of IMC Clubs. The website for IMC Clubs is http://www.imcclubs.com click Join Now and follow the instructions if you care to join as a member. The IMC Club is a membership based Non-Profit 501(c)(3) organization focused on instrument rated pilots and flight instructors, with a network of chapters throughout the nation. At IMC Club our purpose is to promote instrument flying, proficiency and safety. Along with IFR flying and monthly local chapter meetings, we offer a resource rich website which provides an electronic experience base. Our intent is to create a community of pilots in order to share information, provide recognition foster communications, promote safety and build proficiency in instrument flying. IMC Club Chapters offer monthly meetings in which pilots can network and share knowledge and experiences. Third, we are using Pilot Works for training content. The training they provide is multi-media and Wings Certified for credit. To visit their website http://pilotworkshop.com/you can join as a subscriber of their free weekly Pilots Tips for you can subscribe to full content of your own if you want. They currently have 40 training sessions on-line. Both are scenario based training and provide for interactive group discussion with those in attendance. Four options are presented for each scenario. The group votes and the most popular option is submitted. The group gets to learn how everyone else who took the scenario voted. Over 600 pilots have looked at each scenario so you get to see how your discussion faired compared to all the others. Full resources are provided for each scenario and four CFII instructors discuss each one afterwards. Please join us for our next scheduled IMC Club meeting of the Toledo Chapter at the EAA Chapter 582 hanger March, 24, 2014. Thanks to all of you for your interest in being a good pilot and for your willingness to learn and to help others. We are off to a GREAT START so plan on attending our next meeting and bring someone with you.